Denapp offers to your needs tailored, individual software. Here we rely on multi-tiered, scaleable architectures with easily customizable core components which communicate with standardized interfaces. Such components can be exchanged with low technical and financial effort and thus quickly can be adapted to changing requirements. The decreasing costs and the associated reduction of risks reduce the horrors of future adjustments and make it possible to forward the even more dynamic modernization of your data processing. Your software is very well prepared for unforeseen events and you can see the future with composure. Software is subject to a rapid process of renewal. Constantly, new technologies are developed and optimized and thus at some point due to changed conditions, every software needs to be customized or replaced. Denapp analyzes your existing installation, indicates possible solutions and implements the approach favored by you. 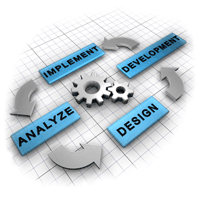 Our accompanying quality assurance and technical assistance ensure the successful launch within your organization. Even after the rollout, you can count on our support, either through administrative activities or staff training. Do you have further questions? Contact us.